Anywho, one of my girlfriends gifted me a book with 39 DIY crafts for my birthday. 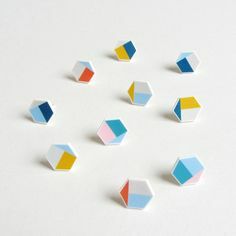 The project that that really caught my eye were DIY hexagon earrings. Trace hexagon (or any shape really!) onto wrong side of scrapbook paper. Carefully cut out with scissors on the inside of your trace line so there are no marks. Glue paper onto hexagon shape and leave until dry. Glue hexagon shape onto earring post and leave to dry. If the paper is slightly overlapping the hexagon shape, lightly sand so sides are flush .. and voila! I’ve ordered some earrings posts on eBay, as our local craft store didn’t have any in stock, and when I looked at the price they were quite expensive .. So this is going to be on my DIY list next! I love little geometric shape earrings, like the ones pictured because they’re simple yet effective. I’ll be sure to post a picture once I’ve made mine! I think I might play with painting the hexagon shape before I overlay the scrapbook paper, just so the underside isn’t a light wood colour. This idea has got my creative juices flowing, because I love simple yet effective jewellery. I personally don’t wear, or spend a lot on jewellery so making my own will be great. I’ve started a Pinterest board for DIY jewellery which you can check out here. Otherwise, have a look at this website for heaps more DIY earring tutorials .. We can all look fab together! « A New Sewing Machine – A Lil Update! I don’t wear earrings but the shape is so irregular and cute! I agree .. Love the geometric shape of them!